I gave this book 4.5 stars. I had such a good time reading it. It had adventure, action, and a romance I could get behind. I'm excited to see where the author goes with this. I'm quite mad at Pasha right now. Pasha is the future Tsar and the best friend of Enchanter One, Nikolai. Pasha was just being such an awful friend. Nikolai kept one secret and Pasha was ready to burn all the bridges. I understand why Nikolai kept his abilities a secret, I mean, how do you tell someone about magic without them thinking you're a complete mental case. I just hope after everything Pasha did he can redeem himself in the next book, because I really did love him up until that point in the book. I loved Vika's relationship with Sergei, her father. I just went on the rant the other day about the whole bad parenting trope in books, especially YA. It was good to see a protagonist who actually had good parent. They seem to be rare in this genre. I was really devastated about what happened with him later in the book, he didn't deserve it. The plot as a whole reminded me of the Night Circus, two contenders in a fight that one must win, only one can survive, the two competitors fall in love. Now while the premise was similar I feel like the author did a really good job of not just writing The Night Circus, but in Russia. It was definitely it's own story. I am very proud. So recently I've been having this issue where I can't seem to get into books right away. Like, I may really love the ending or at most the second half of the book, but anything at the beginning is just an obstacle. I finally think I'm through it because I didn't have any trouble getting into this book at all! It was pretty exciting from the beginning and I didn't have to be dragged along unwillingly, trying to get into it. It was perfect. I loved the chapter lengths in this book. Some were really short, while others were really long. I loved it because whenever the chapters were short I would just keep reading until a long one would come along. It helped me pace myself. I have a real pacing issue. If the chapters are too short I'll read pretty much the whole book at once, and if the chapters are too long, it will take me a long time to read the book. So this was a nice in between. Now I don't know a lot about Russian history, or really anything other than Nicholas II and his family were killed by the people, there was this whole conspiracy about Anastasia living, after they died there were several communist leaders i.e. Lenin and Stalin. And let's not forget, Rasputin. That's pretty much all I know. So it was nice to get a bit of a feel about history, but still having some fantastical elements to it. 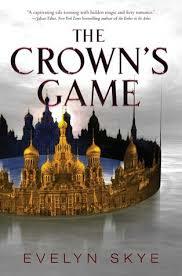 This is probably only the second book I've ever read that was set in Russia, so I plan to read more of those. Hopefully this was a good place to start. Pasha's father, Alexander, almost had my sympathy with his wife being sick, but the more I found out about him the less I could pity him. He was just an awful human being. He continuously cheated on his wife, he had a son that he didn't know about because he didn't bother to stick around, he basically sentenced said son to death, and not to mention he just completely ditched his son's mother after making her love him. He's just a snake and I can't make myself feel sad for him. I liked how the author put French in too, because unlike Russian, I actually know quite a bit of French. That was a lovely little gift. I love reading a book that has a different language in it and I understand what it's saying. It makes me feel smart. I was scrolling through the Goodreads page for this book and I came across a someone who had shelved this book as Instalove. I do not agree with that. Maybe on Pasha's part because he instantly just decided he was in love with Vika, but with Nikolai and Vika I completely disagree. I mea, they spent the first half of the book trying to kill each other. That doesn't scream Instalove to me. Whatever, that's just my take on it. Overall, I thought this was a really well written exciting book that you definitely should read. I promise it's good. Great review! I’m glad you loved this book! I haven’t read it yet but I’m looking forward to read it.